This is the second in a series of Saluki monotypes. 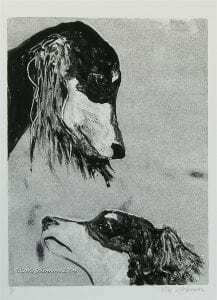 This version of a Saluki with its pup uses the ghost background to accentuate the artwork. This Hand Pulled Print comes with a black mat.